Notes: Freddie Kitchens eager to get to know, coach Odell Beckham Jr.
New Browns coach Freddie Kitchens can’t wait to work with new receiver Odell Beckham Jr.
He’s also eager to build a relationship. “I love great players and I love great people,” Kitchens told reporters Tuesday at the coaches breakfast at the NFL meetings in Arizona. “He’s a great person above all else. Perception is not always reality. I’m anxious to get Odell (to team headquarters) and get to know him as a person. Kitchens’ table was a popular spot, as he’s the underdog first-time coach of a team suddenly considered the favorite in the AFC North. Beckham was the latest, and highest-profile, addition to a transformed roster. He was acquired in a blockbuster trade with the New York Giants on March 13. Beckham hasn’t been to town yet, but the hope is he reports Monday when the Browns begin the voluntary offseason program. Kitchens was asked what his opening line will be when they meet. “done and done,” Beckham tweeted in response. He is perhaps the league’s most popular player — he has 12.8 million Instagram followers — and has dazzled fans with spectacular one-handed catches and long sprints to the end zone. The three-time Pro Bowler wrote on Instagram after the trade he had “mixed emotions,” but Kitchens joined general manager John Dorsey in expressing confidence Beckham will embrace his new situation. 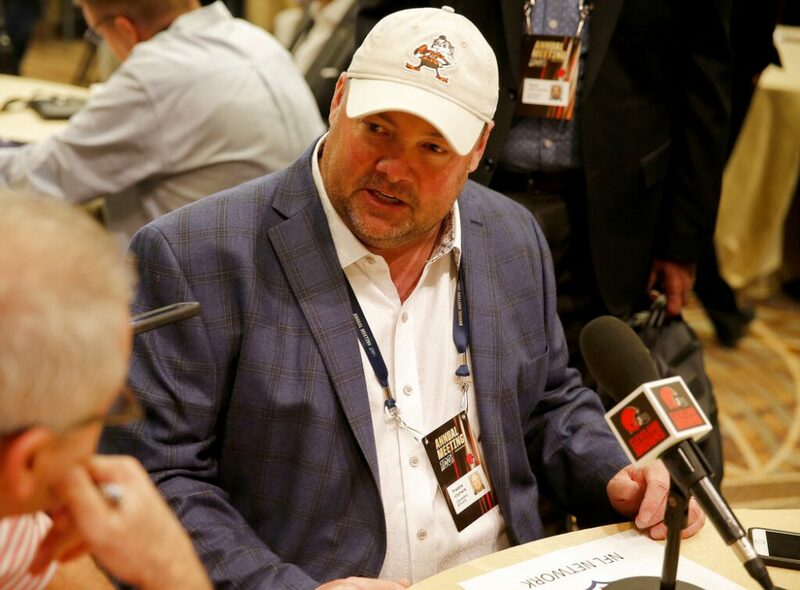 “I can only give him my experience with the fan base and the city itself,” Kitchens said. “We have a great city. I love Cleveland. I wasn’t blowing smoke up y’all’s a– when I told you that. Kitchens, who wrote a goodbye letter to Arizona fans when he joined the Browns last season after 11 with the Cardinals, said it’s easy to understand why Beckham needed time to process the life change. He spent the first five years of his career with the Giants. “He’s no different than anyone else,” Kitchens said. “He’s a human being. He has feelings. He’s not just some cartoon character who kind of pops up in the media. Two weeks ago his life was turned upside down. He didn’t know he was getting traded. He had to take some time to see what life was going to be like now, post-New York. 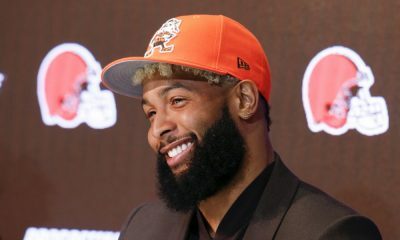 Beckham already has relationships with receiver Jarvis Landry — a teammate at LSU — and quarterback Baker Mayfield. Kitchens was asked about Mayfield and Beckham having the potential to be dynamite together. The Ravens won the North last year after beating the Browns in the finale for a split of the season series. Coach John Harbaugh won’t hand the crown to the Browns, but he is willing to pump up the expectations. As expected, the Browns plan to change uniforms in 2020. “I think we got it right this time,” owner Dee Haslam told reporters in Arizona. The last switch came in 2015, but the new wardrobe was panned and disliked by many fans. League rules don’t allow a change for at least five years. After meeting with city leaders about potential changes to the lakefront, FirstEnergy Stadium will stay at its location on Lake Erie next to the Rock & Roll Hall of Fame. She said it’s important to add a walkway to make the stadium more accessible for pedestrians. Training camp will remain at team headquarters in Berea, Jimmy Haslam said. The team had considered moving it to Columbus. Kitchens hasn’t reached that conclusion and said he can envision Hunt, Johnson and starter Nick Chubb all being used. “I don’t know why we would ever want to like just voluntarily give up a good football player,” Kitchens said. “Duke Johnson is a good football player. Duke Johnson will have a role on our football team. Hunt has been at team headquarters since signing and is expected to join his teammates Monday. He’s allowed to practice and play in the preseason before an eight-game suspension from the league starts Aug. 31. He was suspended for two off-field altercations in 2018, including one in which he shoved and kicked a woman. The Browns are asking the NFL to allow Hunt to stay with the team through the suspension, which would be a change to policy. The Super Bowl champion Patriots will host the Sunday night spotlight game Week 1, and the Browns are a candidate to visit New England. The Browns are a “hot” team, expected to be on prime time often and make sense as the opponent — as do the Chiefs, Cowboys and Steelers. Dorsey would be fine if the Browns draw the tough opening assignment.